Billionaire miner Clive Palmer has expanded his interests in Queensland golf, acquiring the Sea Temple Golf and Country Club at Port Douglas after making an aerial inspection of the property by helicopter recently. Palmer confirmed the purchase saying he had signed an ‘unconditional’ deal to purchase the resort, reportedly for $7 million. Sea Temple was owned by the Juniper Group and has been on the market for a year. The deal includes the idyllic 18-hole golf course on the fringe of the tropical Daintree Rainforest, designed by Thomson, Wolveridge, Perrett, a housing estate development with 45 home sites fronting the golf course and existing development approval for an additional 10 fairway lots. Mr Palmer said he had no immediate plans for the golf course and surrounding residential land. “I haven’t decided but I am happy for it to continue as a golf course,” Palmer said. 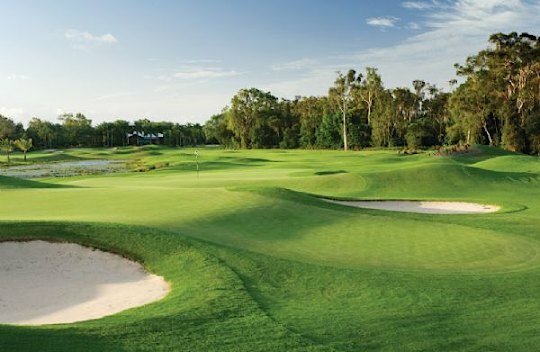 The deal marks Palmer’s first investment in the far north and he said he had personally bought the course, not his company, which owned three other courses in south-east Queensland. Palmer bought the then Hyatt Regency Coolum Resort on the Sunshine Coast and the Robina Woods and Colonial Golf Courses on the Gold Coast in 2011, renaming all three as Palmer Coolum Resort, Palmer Gold Coast and Palmer Colonial respectively.